valentine's day, though not a "big" holiday is still richly laced in tradition. the sentiments once did and still do come from the heart. let's face it, you may *have* to buy certain people christmas gifts but you only give valentines to those that hold a special place in your heart. p.s. the resources section contains several web sites that sell wonderful papers, teach paper and lace making as well as victorian ribbon work-all wonderful projects to incorporate into a valentine for someone special. Just wanted to commend you on the article for CLOTH DOLL! Very nice!!! For the 1999 Valley Forge/gallery of American Craftsmen show I've been trying to do some different things... smaller bunnies and bears stuffed with excelsior and aged. Lots of rabbits, hares and bunnies... (It's Easter, you know!) Even a few little mohair chicks peep, peep, peeping around! Getting a little crazy and making spring colored bunnies (yes, pink, lavender, blue, yellow, etc.) but then dunkin' them in the tea, dye, coffee, etc. Dirty, ole pnk" happy creating to all, and especially those getting ready for shows!!! "One thing I'm working on and for a change of pace, is a hand woven rag rug which will be approx. 24 x 36 - actually longer with fringe. What a fantastic way to use up that yardage of fabric you fell in love with when you bought it 5 years ago or those pieces of fabric left over from making doll clothing that you just hate to part with because you like the color. You wouldn't believe how great printed fabrics look when used in the rug. I used one paisley print done in tan, brown & peach and it looks like a tweed when woven up. Then I used up my brown with some small design on it that is a poly/cotton that I bought about 8 years ago, but that looked great with the paisley. Finally I used up that 2 yards of autumn print that I got tired of. The rug is going to fit right in with my country home with all those earthy colors. The rug project was started while waiting for the supplies to arrive so I could begin Shari Lutz's Izannah Walker doll that was featured in The Cloth Doll magazine. I've since gotten the supplies and I am working on two heads. I want both a black and white dollie and am now at the fine sanding of the heads. Anyone who would like to make the doll but is wondering if it will be difficult, have no fear. Shari has been very responsive to my questions and has a true interest in how I am doing. "Seem to be marching up and down in the one spot here. I have been making a doll that involves some paiper mache but am having a devil of a time with the face - papier mache wouldn't stick... I used paper mache mix, it said to mix with water, smear glue on the surface you will apply the paper to, and stick it on. I got balls of paper, wouldn't stick to anything." next make sure you wash the glue off of your hands before going to the papier mache, don't let the glue dry before adding the papier mache and make sure your papier mache is not too runny or lumpy. you should be able to hold it in your fingers without it running thru yet be able to squeeze it and have some liquid run out (as well as a bit of the mache). the shakers often used the heart and hand motif and their motto was: "hands to work, hearts to God". of course the fact that the shakers housed men and women (including spouses) in separate parts of their houses didn't allow for too much romance. heart and hand stitchery. sizes may vary this example is 5"X7". draw and cut out hand & heart from paper. cut a black wool back ground 5" x 7" trace the heart on red wool (use chalk)& the hand with pencil on white wool. 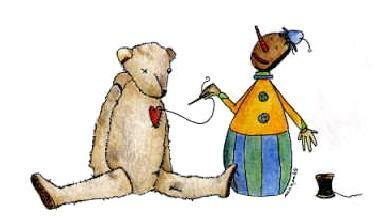 cut the red wool heart & sew the heart to the white wool hand before cutting hand from white wool. cut the hand and sew to black backing. embroider with saying if desired. use the ready made craft store paper mache hearts paint with a Barn Red shade and dry several hours. make a double boiler with an old can and shallow pan of water. (caution do not leave unattended) on a low heat melt bee's wax in the can . add scent if desired. over a protected surface, "paint" the hearts (one side at a time ) with wax using a 1-inch wide paintbrush. (note: this brush can be used again for wax work) add a few whole all spice pieces to the wet wax before it cools. when first side cools paint second side. You can make it as lumpy as you want by adding on more layers of wax and spices. for variation try cloves, small pieces of dried orange peels, dried rose petals, and so forth. note: the color your wax is (candle, tart), will influence the color of your end product. also you can replace the string hanger with a 3/4" torn piece of homespun for a more primitive look. lehn ware: joseph lehn,(1798-1982), spent the long winter months on his pennsylvaiia farm producing small ,turned wooden containers- egg cups,vases, pin cups, spice holders, saffron cups,etc. - all of which are very collectible today . patina: a thin layer of corrosion usually brown or green that appears on copper of copper alloys, such as bronze, as a result of natural or artificial oxidation. the sheen produced by age and use on any antique surface. in the middle ages suitors often spoke or sang their valentine greetings. it wasn't until after about 1400 that the first written valentines were exchanged as is evident by a surviving sample in the british museum (see prose for verse from this valentine). these hand made early valentines were popular in england and given in place of valentine gifts. ACROSTIC: the loved one's name was used on the card. each letter of the name began a sentence of sentiment. CUT PAPERS: were made to have a lace like appearance by folding and cutting the design with small sharp scissors. PINPRICK: a needle was used to create the look of lace by pricking tiny holes in a paper to form a design. THEOREM or POONAH: an oriental style valentine, these designs were cut in oil paper then stenciled onto paper. REBUS: tiny pictures were placed in lieu of some of the written words. such as an human eye in place of the word "I". PUZZLE PURSE: among their many folds these contained verses that had to be read in a certain order. FRAKTUR: these contained illuminated manuscripts and ornate lettering. the first manufactured valentines surfaced in the early 1800's. assembled in factories and painted by hand the images were in black and white. later in the mid 1800's more flourishes were added such as lace and ribbon and paper lace. machine made valentines came in the late 1800's. with the turn of the century valentine manufacturer surfaced called Norcross which eventually became our "hallmark". each year they display rare valentines from years past in some of their many chain stores. large selection papers, aged wooden finials, and dried fruits. 16 pages, black & white photos with instructions for "twining" a rug of any size and for building a frame to accomplish the same. this is a nice book! but out of print, check your library. -- Sweetly consent or else deny. ere it go Wilt thou be mine, Love?